Providing free internet access, Apartment Boja is located a 5-minute walk from the centre of Biograd Na Moru and the closest beach. It presents self-catering accommodation equipped with air conditioning and an outdoors terrace with a seating area. This apartment comprises a well-equipped kitchen with dining area and a sofa seating. Featuring a shower, private toilet also comes with a hairdryer. 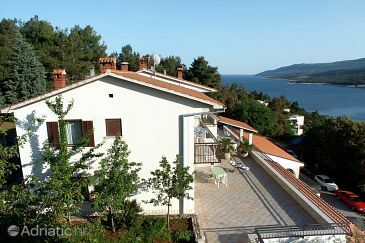 Apartment Boja ~0.1 km, Biograd Na Moru Providing free internet access, Apartment Boja is located a 5-minute walk from the centre of Biograd na Moru and the closest beach. It presents self-catering accommodation equipped with air conditioning and an outdoors terrace with a seating area. This apartment comprises a well-equipped kitchen with dining area and a sofa seating. Featuring a shower, private toilet also comes with a hairdryer. Turanj ( ~ 4.4 km ): 60+ accommodation units. Pakostane ( ~ 5.7 km ): 74+ apartments. Drage ( ~ 9.2 km ): 40+ apartments. Sveti Petar ( ~ 9.4 km ): 75+ accommodation units. Beach Drazica, Biograd ~ 0,8 km from Apartment Boja Gravel beach: ideal for families, recommended for young people, awarded with blue flag, with restaurant, with caffe bar, equipped with showers. Excellent choice of watersports. Beach Bosana, Biograd ~ 0,9 km from Apartment Boja Gravel beach: ideal for families, recommended for young people, with restaurant, with caffe bar. Excellent choice of watersports. Beach Soline, Biograd ~ 1 km from Apartment Boja Sandy beach: ideal for families, recommended for young people, with restaurant, with caffe bar, equipped with showers. Excellent choice of watersports. Beach Kumenat, Biograd ~ 1,9 km from Apartment Boja Gravel beach: ideal for families, with caffe bar. Beach Iza Banja ~ 2,8 km from Apartment Boja Sandy beach: ideal for families, recommended for young people, awarded with blue flag, with restaurant, with caffe bar, equipped with showers. Excellent choice of watersports.